Here is a sneak preview of a new series of Southend postcards I'm working on!!! Using original vintage postcards, I'm planning on putting together collages for each decade of the last century. I've bought a good selection of postcards of Southend at antique fairs and markets, which form the backdrop for these collages. It'll be fun sifting through the ArtPix archives for suitable images for all the decades! This one is for the 1960s, so you can see an iconic Lambretta and Mini plus an assortment of groovy young things all sporting the latest 60s styles! 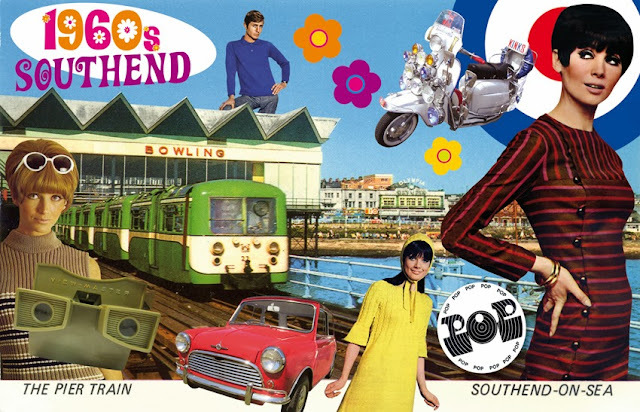 The postcard shows you the fantastic old pier train and the sadly demised Bowling Alley on Southend pier. I'm pleased to say I've already sold a framed version of this pic at a recent fair, so hopefully this will be a popular range to rival my Dazzling Decades!! I've also finished the 1910s Southend postcard, so the series is already taking shape. Stay tuned here for more postcard updates!